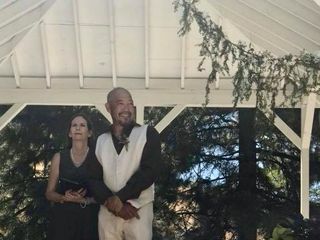 We shared our ceremony with Carol and our closest friends and family recently, and I couldn't be happier with the experience we had. Carol guided us towards the ceremony that was right for my now husband and I, and it went perfectly! Professional, courteous, and loving, Carol felt like having another member of our family there with us. Thank you for making me feel like part of your closest friends and family. It was a wonderful day. Carol did a wonderful job officiating our wedding. She welcomed our modifications of the ceremony script to personalize it, and was able to deliver it smoothly. She made us all feel at ease and went with the flow, even when things were slightly off course (like when the rings fell off our dog's ring bearer pillow!) We are grateful for her services and for her contribution to a beautiful, memorable day! Thank you for allowing me to be part of your special day! Carol was very easy to work with and responsive with communications. She really does customize your service to whatever you like. 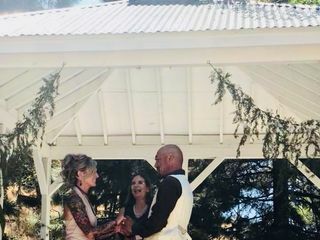 Our ceremony was small, informal and held in our backyard. We included our dogs in the ceremony, one that is only 3 months old. She was very patient with the puppy and my screaming 18 month nephew running around. I especially appreciate her making my husband feel better, because he was very nervous prior to the ceremony. She really took over by directing the guests and the ceremony. Even laughing at our little mishaps. She is very professional and I highly recommend her to anyone. Thank you so much for a fun wedding. Your group was great and I love, love, love dogs in weddings. And kids. It was really a beautiful day. Such a joy . Would always recommend her. I had so much fun. The evening was wonderful and your friends and family warm. I wish you both so many years of happiness together! She was absolutely amazing! She was personable, easy to contact and got back to us quickly. We definitely made the right choice! Thank you for a fun event. Great group and we had awesome weather! I can't wait to see the pictures. I wish you the best. Carol was absolutely wonderful as our wedding officiant. From the very beginning of the process she was kind, responsive, and helpful. She lets the process be completely individualized. Everyone complimented on how unique and personal our ceremony was and that was thanks to Carol. She is all about making the couples ideas and dreams come to life while also being very affordable. If you’re looking for a ceremony that’s made just for you and your SO, look no further. Carol is amazing. Carol was a great officiant. She met with me beforehand to customize the ceremony. She was responsive to my questions and comments throughout the days leading up to the wedding. The ceremony was everything we had hoped for. She made us feel calm and relaxed as she coached us before the ceremony. I would recommend her to anyone looking for an officiant. Thank you for including me in your special day at the Lake! It was beautiful and fun and I wish you all the best. Carol was amazing! 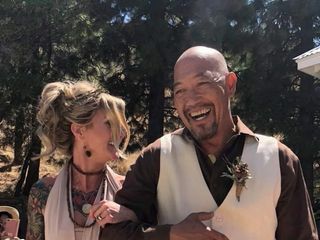 We traveled down from Oregon and didn’t really have an idea of what we wanted for our ceremony and Carol prepared the sweetest and perfect ceremony for our day. It couldn’t have been more perfect,exactly what we wanted. Thank you. We had a lot of fun! Our original officiant had to change her plans due to life and Carol was extremely accommodating . She worked with me over the phone and was speedy on getting everything done. She was available for any questions and made the big day great. Carol was wonderful! On time, very patient, and so nice! Carol was great to work with and put me at ease on the day of the wedding! 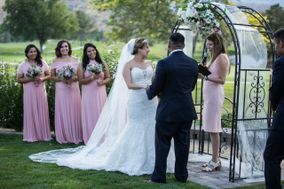 She was quick to respond to questions, her attire worked great with our wedding and she took charge of the reception with our loud bridal party! I would hire Carol again and again, she was a great touch to the wedding! Thank you for a fun weekend! Carole was so great! She really helped us piece everything together, as we planned our whole wedding without a planner. She made everything fun and easy to follow, the whole wedding party loved her! She personalized our entire ceremony, it was everything we wanted and more! Carol was awesome and very easy to work with. 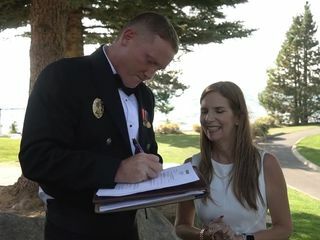 She made things go smoothly during our wedding, and was very helpful giving us options and suggestions for the ceremony. She will work with you on whatever type of wedding you want to do, and when you need advice she responds quickly. 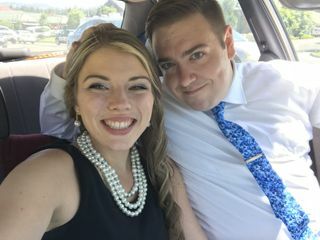 She has a great sense of humor, and it was fun working with her for our special day! She will provide you with the quality of service exactly you want it to be, or even better. She is passionate to learn who you are and what kind of service you want from her. She is versatile, considerate, and professional. You will never be disappointed with her service. She is highly recommended. Thank you for allowing me to be part of your special day! Love the pictures! Thank you for including me in your special day! Carol was amazing!! She was very responsive to all emails and calls and provided us with a one of a kind ceremony! I would highly recommend her as an officiant!! Carol is amazing. She made sure everyone was OK and helped us get centered and calm. The ceremony was so sweet and so us. Thank you Carol! Thank you so much for including me in your special day!! When we first started the wedding planning process, we were looking for someone who was organized, responsive, and experienced, and that is exactly what we got with Carol. Throughout the entire process, Carol was very accommodating, professional, and easy to work with. If asked, I would definitely recommend her services to any friends or family seeking a wedding officiant. Thanks so much for allowing me to be part of your special day! We loved having her as our officiant! 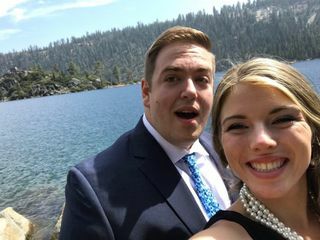 She was great to work with, listened to what we had to say to make sure we had a special and unique wedding and was very professional the whole time! She also made sure we stayed calm (that day can be a very stressful one!) and told us everything will be ok, which is very great to hear when you are extremely anxious. Overall we would highly recommend!! Thank you so much for such a wonderful day! Carol was great. She helped plan out our ceremony and had great suggestions to make everything a breeze. Carol was very quick to respond. She did amazing on the ceremony preparation to tailor it how we saw it. Thank you for including me in your special day. Carol was wonderful to work with, very professional, easy to work with, and very pleasant. She helped us create the perfect vows by providing sample vows that we chose from. I highly recommend her. Thank you for a fun evening! Carol is so wonderful! 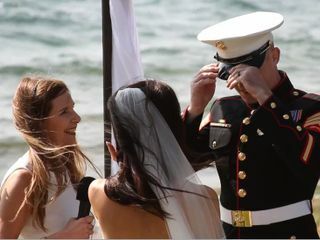 She was able to come meet us and perform our ceremony within a weeks notice. She is very professional, organized and her ceremony options are beautiful!